This sounds like a fun one. Action in the Community Through Service (ACTS) is a mainstay in the Prince William County nonprofit scene. They’ve been helping people in our area for as long as I can remember. One of my first volunteer memories is helping with Operation Turkey, and another shortly after that was feeding people dinner at the emergency shelter with Girl Scouts. 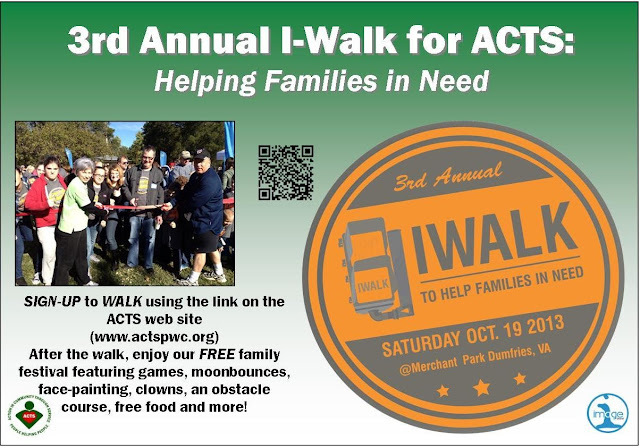 ACTS is holding their 3rd Annual iWalk for ACTS to benefit families in need on Saturday, October 19th in Merchant’s Park in Dumfries. After the walk there’s a FREE Family Festival with games, moonbounces, face painting, clowns, obstacle courses, free food, and more. This definitely sounds like a great day for the family. Don’t wait until October, though! Sign up now for a family rate of $50, or, you can sign up as a fundraiser and get those in your life to help you sponsor this great walk!